Leaving water leaks unaddressed can lead to thousands of dollars in property damage. Large water tanks for instance, are extremely susceptible to leakage problems. To add to the problem, it can be pretty tough locating submerged leaks. If you are experiencing this problem, don’t panic. We have a solution for you. Water Leak Detectors offer Digital Camera Leak Detection service. The Digital Camera Leak Detection process employs powerful digital cameras that can quickly spot any leaks. Even underwater pipe leaks aren’t spared. Aided by advanced sensors, our cameras are able to capture and locate even the minutest leaks. When the camera sensors detect a leak, they trigger a bright LED light to flash. This alerts our technicians of the type and location of the leak. So if you’re bothered by a reeking smell coming from pipelines or drain but unable to locate the leak, give us a call. 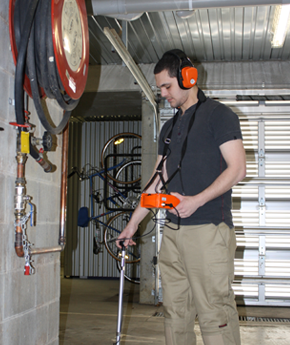 Using state-of the art equipment, our technicians will locate your leaks accurately. Another area in which Digital Camera Leak Detection excels is under water leak detection. If you have leaking pipes submerged underwater, one of the most effective tools for finding them is the Digital Camera Leak Detection device. Thanks to its high sensitivity to light intensity variations, the digital camera water leak detector is able to pinpoint underwater pipe leaks with great precision. We have had years of experience helping clients solve their pipe and underwater leakage issues. Headquartered in Melbourne, Water Leak Detectors are a team of professionally trained, licensed specialists offering safe, fast, cost-effective underwater pipe leak detection and repair. Call us now for more information about our services!